In this book, Buddhist nun Pema Chodron offers short, stand-alone readings designed to help us cultivate compasion and awareness amid the challenges of daily living. More than a collection of thoughts for the day, Comfortable with Uncertainty offers a progressive program of spiritual study. Inspired by the Buddhist tradition of the 108-day retreat, the book leads the reader through essential concepts, themes, and practices on the Buddhist path. Comfortable with Uncertainty does not assume prior knowledge of Buddhist thought or practice. 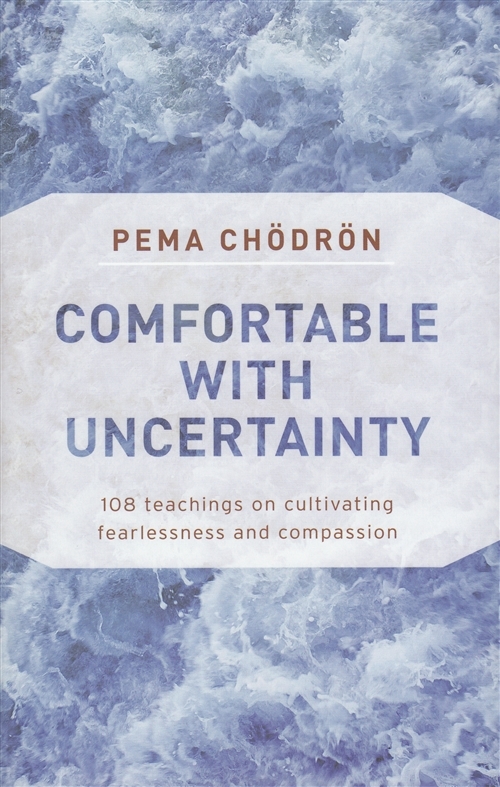 It features the most essential and stirring passages from Chodron's previous books, exploring topics such as loving-kindness, meditation, mindfulness, "nowness," letting go, and working with fear and other painful emotions. Through the course of the book, readers will learn practical methods for heightening awareness and overcoming habitual patterns that block compassion. Comfortable with Uncertainty, like a set of traditional Buddhist prayer beads, strings together 108 gems that will guide and inspire us. Pema Chödrön is an American Buddhist nun and one of the foremost students of Sakyong Mipham Rinpoche, the current Shambhala lineage holder, and Chögyam Trungpa Rinpoche. She is the Director of Gampo Abbey, Nova Scotia, the first Tibetan monastery in North America established for Westerners. She is famed for her clear and refreshing presentation of traditional teachings on meditation, compassion and loving-kindness.